When I was a kid, my parents bought the Encyclopedia Britannica. (For you youngsters in the audience, that was a big shelf of books containing all the good stuff that’s now on the internet.) One of the great features was that it came with a bunch of coupons you could mail in to get customized reports on any topic. (Looking back, it seems possible that we were the only subscribers in the world who were not submitting these as schoolwork.) Alas, The Monkey Cage can’t redeem every reader’s coupons—but today we’re here for you, Jeremy. I’m not sure your use of the term “upper middle class” is apt, but putting that aside, it’s very interesting that Obama lost the non-South voters in the 30th-80th percentiles and performed poorly among the South voters in those percentiles as well. That suggests that his attempt to tailor policies and message to appeal to the middle class has not been successful. There aren’t so many voters at the very high end, but there’s a lot of money there. So it’s always going to be a priority for candidates to appeal to the rich. Even though (according to the above graph) Obama lost to Romney among rich whites, it makes sense that Obama fought hard for the votes of that group. Andy, we must have been watching different first terms and campaigns. What I saw was not Obama trying to appeal to the rich but his trying to appeal to the middle class, and it’s that category in which his white vote share seems to have been worst. Clearly he was happy to get any votes of the rich that he could, and he was certainly willing to schmooze with them at fundraisers, but it was the middle class that prevailed in his rhetoric. And that’s not limited to the first term; see esp. the 2013 SOTU. I agree that Obama was aiming for the middle class, which is where the mass of the voters are. I’m just saying that, while loudly targeting the middle-class vote, he was also quietly trying to keep as much of the support of the rich as he could. Pretty much, though, the electorate is so polarized that all the targeting in the world doesn’t do so much to change many people’s opinions about which party to vote for. Some studies have found that race hurt Obama with whites, and I am wondering if any data shed light on the distribution of the racial resentment effect. The other thing is married white voters tend to lean right, and they might enjoy higher household incomes. Something looks wrong here with either the sample, the weights, or the code generating this graph. It is hard to see how this graph is consistent with Obama winning the overall popular vote 51.1% to 47.2%. This chart is for “white voters” only in those income brackets. Obama lost to Romney among white voters 59-39 percent, but Obama got 80 percent of the “non-white” vote. I’m very sorry. I retract my previous comment. My mistake. Obviously Obama’s *white* pop vote % is substantially less than his overall pop vote %. I really appreciate the Monkey Cage and Larry Bartels coming through so expeditiously! I was hoping for just a link. This is great data. RobC writes: “That suggests that his attempt to tailor policies and message to appeal to the middle class has not been successful”. I think you’re forgetting that Obama did win about 80% of the non-white middle class vote. Obama received about 40% of the white vote nationally according to the exits (as most Democrats have since the mid 1970’s). On average, the non-South is outperforming this number regardless of income. We’d need to see the underlying data to see how this squares with the exit polls, but my point is that the 50% mark is not the best baseline for looking at Democratic national candidates. It also means that higher income earners, middle class, are also better educated and know the meaning of the need to have a government that works for all the people. If democracy is to survive, WE THE PEOPL:E, have to take our power back from the NORQUIST revolutionaries that are determined to weaken federalism in order to strengthen the building of state fiefdoms. Who owns the businesses in your state that determine legislative outcomes: Kochs, Adelson, Massey Mines? All more interested in profits and power than democracy or patriotism. They are the globalists that Rand Paul spoke to, the real globalists who value their money over cntry and ppl. How does this square with the finding that income effect is stronger in the red states (South) than the blue states (North)? Er, different election? But note that “red states” /= “(South)” and “blue states” /= “(North),” so I don’t really know. I know you don’t have state level data, but any idea how The South is defined here? I can’t tell from poking around the CCAP site. It stands to reason that the wealthiest people in Alexandria, VA would be more pro-Obama than the wealthiest people in Dallas, but it’s possible neither of those groups counts as southern. No matter what, still fascinating. CCAP uses the Census definition of regions. About 85% of the “southern” respondents are from former Confederate states (which seems to me to be the best definition for most political purposes). Reclassifying the remaining 15% (DE, DC, KY, MD, OK, WV) as “Non-South” would not change the picture substantially. Does anybody else see the tension between this article and the one just three articles earlier by Diego von Vacano on Race and IQ? Here nobody argues with what I assume is a definition of race based on self-identification, but I think Vacano’s central purpose is to argue against glibly accepting that idea. To put it as simply as possible, are any Texas Hispanics included in the chart of southern whites? I would suggest the categorization was accepted by Jason Richwine’s thesis committee for the same reason it is accepted here; namely, how else would we ever be able to do any kind of politics analysis. Mike: I didn’t make the chart, but if Larry followed standard practice, these are respondents who identified as white but did not identify as Hispanic. Having had some personal experience with Larry, I am sure he knows, and absent some special situation, intelligently follows “standard practice”. On the other hand, don’t you think there might be a correlation between a person, say from Cuba or Brazil, who identified as white and not Hispanic and voting Republican? Interesting question. I don’t know how much political or social “leeway” there is in Hispanic self-identification. But, yes, the CCAP classification is based entirely on self-identification, and the “white” category excludes people who self-identify as Hispanics. 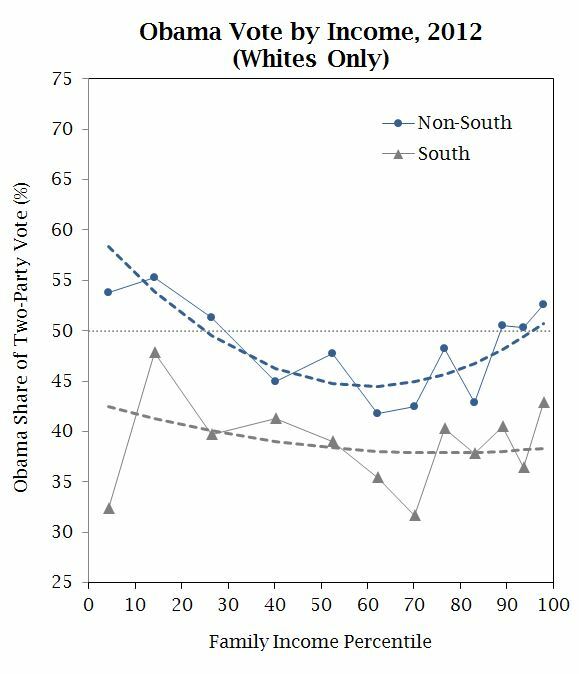 As a complete layman I was just wondering if this graph tells us that the socio-economic cleavage is less prominent among Southern whites than it is among non-Southern whites. After all some scholars have always made the argument that economic cleavages in the South drove realignment in the region. Fascinating. It appears from the description that each decile is separated by roughly 15k, which means Obama carries non-Southern whites somewhere below the 45k mark and again somewhere above the 135k mark. Larry, can you provide the income thresholds for each decile?